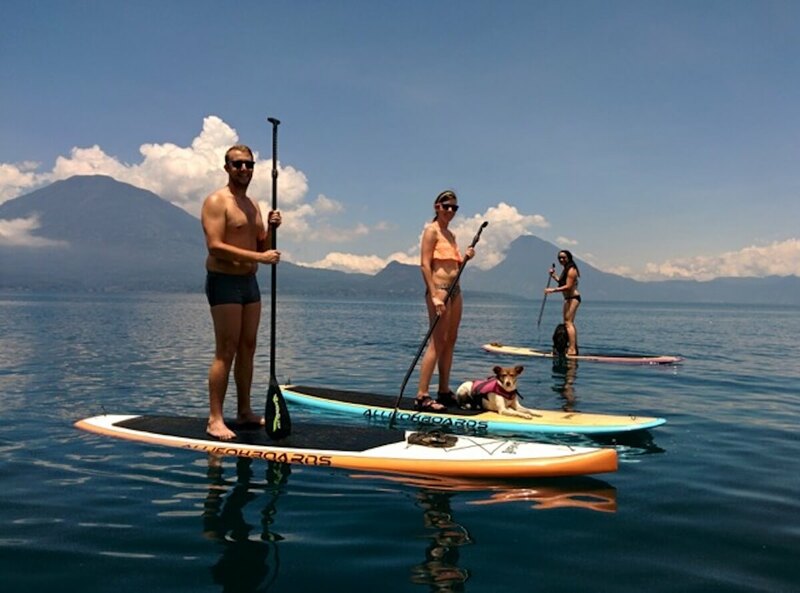 This full day of Lake Atitlan adventures stand up paddleboard and hike excursion along the rugged north shore of Lake Atitlan. Paddle and hike to see Santa Cruz, San Marcos, Tzununa, and Jaibalito. Meet at the hotel dock to gear up for a day of adventure. It is best to wear your swimsuit or other appropriate boating attire as you will get wet along the way. We supply dry sacks for your backpacks and other gear for the second part of the day. Be sure to bring your camera, drinking water, and some sunscreen. We paddle for 1 ½ -2 hours along the shores of Santa Cruz la Laguna, El Jaibalito, and Tzununa, ending in San Marcos. You will have many up close encounters with Mayan men who fish from hand hewn cayukas as they have for centuries. You will feel privileged to share the lake with these proud fishermen who make Lake Atitlan so unique. You paddle along rugged cliff faces filled with exotic plant and bird life. You have the opportunity to cliff- jump into the crystal clear waters, or just enjoy a swim and sun. We pull into the Bay of San Marcos and gear up for the next part of our adventure. The north shore of Lake Atitlan has no true road access, so you will be hiking along ancient paths that have been used by the Maya for centuries. You will view villagers going about their daily life, encounter farmers tending their maize and coffee fields, and see some of the most magnificent scenery in the world. This rugged and remote section of Lake Atitlan has barely been touched by the outside world. Our hike takes us several hundred feet above the ever changing waters of Atitlan for breath taking views of the famous volcanos. We end our hike in Santa Cruz la Laguna at the end of our day of adventure. According to the Outdoor Foundation’s 2013 Outdoor Participation Report, stand up paddle boarding was listed as the most popular outdoor activity among first-time participants. The Outdoor Foundation’s 2015 Special Report into Paddlesports found that 2.8 Million of Americans participated in standup paddlboarding in 2014. SUP the Mag, adventure guide Samuel SUPing around Lake Atitlan. Aaron Teasdale the author won the Lowell Thomas Award for best Adventure Travel story of 2015, and best Travel Writer of the Year by the Society of American Travel Writers Foundation. Great reading!